Hello again and sorry for keeping you waiting! As I told you there were still stuff to acquire to complete the darkroom. After several weeks of searching the second hand market I met up with a guy who actually was a photography teacher. He was selling a box of old darkroom stuff which he hadn't been using for many years. I was actually only interested in the enlarging easel he had, but he didn't want to sell it alone. The box had a lot of stuff including a large developing tank and a bunch of spirals. It was a good deal so I didn't mind getting the extra bonus. After a good clean they where ready to be used again! I had been looking for a working table for a long time. I just didn't seem to find the right one. It was either too low or too expensive for a working table. I decided to design my own table and make it myself. As I was on my way to leave to go to the DIY store I came across a stainless steel table through an add. The table had almost perfect dimensions. So I went to the guy's apartment and had a look at the table and finally bought it! It was a table from IKEA called UTBY which I got for only a fraction of the original cost. 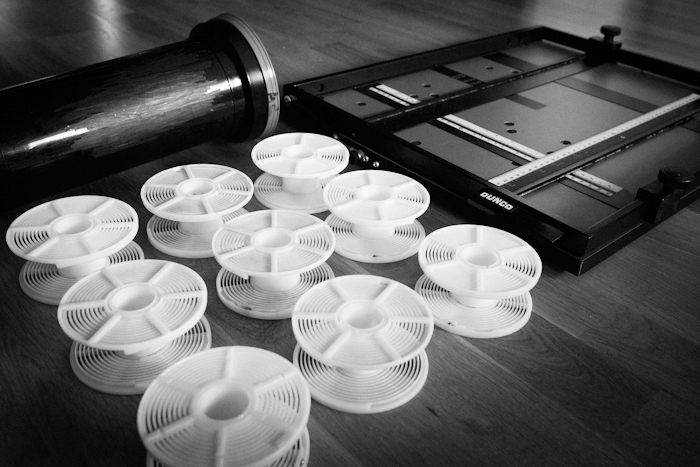 I also wanted a shelf at the bottom of the table to store all the darkroom equipment. Later I bought two pieces of wooden planks and customized it to fit the bottom. I needed wheels on the tables four legs to move the table more easily in and out of the bathroom. So I talked to my friend Martin about it and he helped me weld the wheels onto the legs. Thanks again! 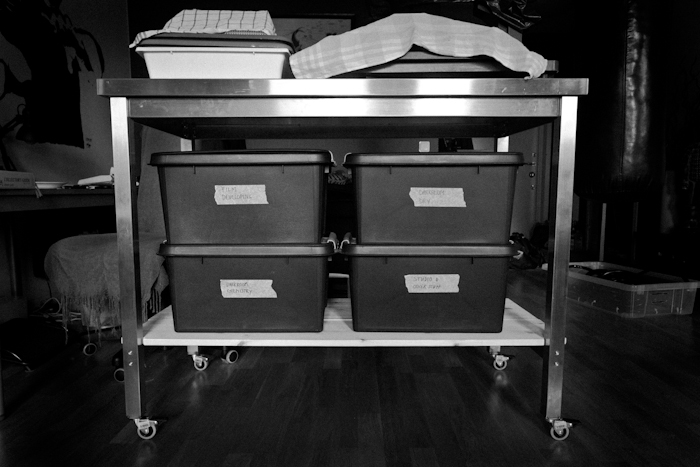 There was a lot of stuff to organize so I bought four boxes in tough plastic with a sealable lid to sort out the darkroom equipment. In these I fitted the paper and film developing chemicals, film developing equipment and miscellaneous dry darkroom stuff. Finally the working table was complete! I was so happy because it had been a long journey. Next was the print washer. I tried to build my own washer, but I gave up in the end. The plan was to use a large plastic container/box and have a gardening hose run along the bottom of it. Then make holes in the hose so that the water flowed in a circular motion. I got the water to circulate more or less, but the pressure built in the hose was too low. Probably because the holes where too big. This meant that the squirt of water through the holes where diminishing towards the middle and was greater in the beginning and end of the hose. Also the craftsmanship wasn't that pleasing :) So in the end I decided just to have a large developing tray lay at an angle with water overfilling it and access water running down the kitchen sink. In the future when I make larger prints I will need another solution or perhaps save me the trouble and buy me a real washer. I also had to seal my bathroom door tight from light. I considered buying thick black cloth and stick it to the door frame with velcro, but the fabric store didn't have 100% light tight materials. Other stores had materials that was too expensive for me. I had to figure out another way. I eventually sealed the door using sealing strips for sealing windows. It worked rather well but the space between the door and the frame was a little bit irregular so I added some gaffer tape and created wing flaps around the outside of the door. For now this solution works fine. Now I was more or less ready to print! I ordered chemicals, some small trays and pincers from a internet store based in Sweden and paper and some other stuff from Silverprint in the UK.